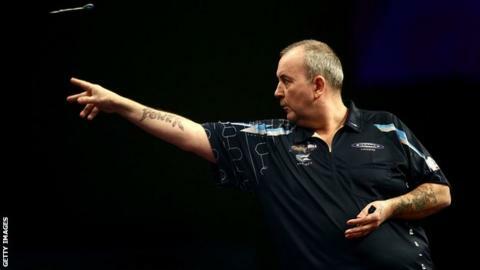 Sixteen-time world champion Phil Taylor moved into the second round of the 2015 PDC event with a 3-0 victory over Germany's Jyhan Artut. Taylor, 54, last won the tournament in January 2013 and will now face either Mark Webster or Ron Meulenkamp in round two on December 28. Earlier at Alexandra Palace, Peter Wright, the runner-up in January 2014, beat Wales' Gerwyn Price 3-0. Twelfth seed Andy Hamilton defeated Dave Richardson 3-2. Debutant Price, who ended his career as a professional rugby player to concentrate on darts, could not record a surprise victory against Scotland's Wright. But Taylor, the most successful player in darts history, had no such problems as he only dropped two legs in three sets. Is Phil Taylor sport's top champion?